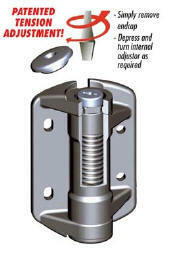 TruClose Self Closing Safety gates hinges. Includes safety cap. Designed for metal gates. This model TruClose Safety Gate Hinge is designed to self-close most metal gates around homes, swimming pools, schools, childcare centres and all other areas where gate safety is a high priority. These hinges will self close a standard gate 1524mm high x 915mm wide up to 30kg in weight. The maximum weight one pair of these hinges will support with correct installation e.g... if a child steps onto the gate, is 205kg. Click the button below to add the TruClose Self Closing SAFETY Gate Hinges (Pair) to your wish list.